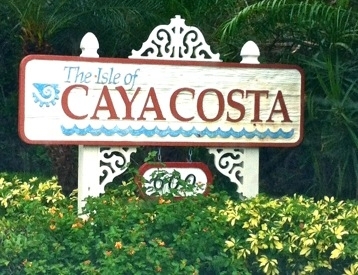 Caya Costa was developed by Bruce Williams Homes in the early to mid-1980s as a deed restricted, planned urban community. The first residence was occupied in June 1984. The neighborhood is close to downtown, adjacent to the water, and has easy access to Tampa and the airport. Amenities include swimming pools and tennis courts. Due to changing economic conditions. Bruce & Williams decided to alter the original design to reduce the number of bay homes and townhomes, to build a wall, and to sell private lots for custom homes on a new street, Marco Drive. Through the years, friendly neighbors have met at the pool for snacks and drinks, pizza and buffet suppers. Interests are diverse. Together, residents have attended baseball games, hockey games, football games and plays. There are Christmas lighting contests, bowling parties, Easter egg hunts, Santa’s visit, cookie exchanges, book clubs and a monthly newsletter. The Association is governed by By-Laws and a Master Declaration that are enforced by a Board of Directors with various committees: Architectural Control, Landscaping, Safety, Social, Budget and others as needed. There are 235 units with 120 townhomes, 45 bay homes and 70 custom homes. It’s a beautiful place to live and it was recognized by the City Beautiful Commission. An attempt was made to request data that is not available to the key that was used to authenticate the request.API Error ID: 707398ADCDB44B69B0B8897FF1347180 The API says: [The API key you supplied is not enabled] While attempting request to (http://api.wolfnet.com/core/auth).